Use your fingerprint to put expenses on the company dime. AmEx already supported consumer and small-business cards, but has now expanded that to corporate accounts. The integration is only available for certain U.S. corporate cards—green, gold, platinum, and Centurion are all on the list, plus a few others. See the full list here. If your corporate AmEx is branded by another financial institution, it might not be supported. It’s unclear why American Express held off on adding support for corporate cards—perhaps execs were waiting to evaluate overall Apple Pay adoption, or to put the service’s security to the test. The company seems pretty sold on the idea now, though. Why this matters: Apple wants Apple Pay to be your go-to way to pay, but it won’t work unless you can use all of your cards wherever you go. Now that the company has support from major, mid-level, and small banks, credit unions, and financial institutions, it’s working to add other types of accounts, like store loyalty cards. That support rolls out with iOS 9 this fall. 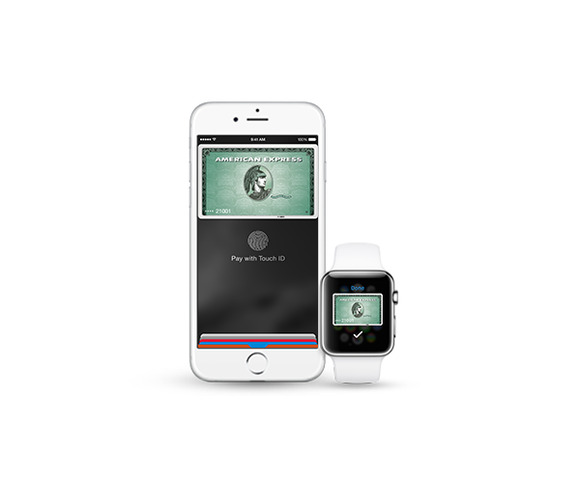 Support for corporate accounts is a huge deal for both AmEx-using companies and Apple. Corporations don’t want to be left in the dust when it comes to embracing new technology, and Apple needs help taking Apple Pay mainstream. This move is a win-win.